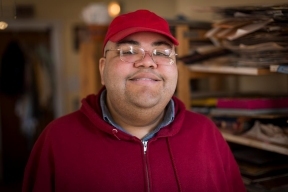 In the small art studio at Esperanza Community Services, a West Town-based nonprofit that serves children and adults with developmental disabilities, several artists sit at tables, working intently on the paintings propped on easels in front of them. Their differing artistic approaches are evident in their pieces, and in the ways they move their brushes across the canvas. One artist creates a constellation of colorful paint dabs and carefully applied geometric shapes. Another is working with blocks of overlapping color applied with bold brushstrokes. 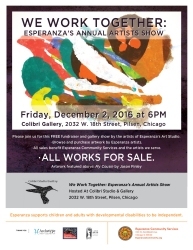 The artists of Esperanza are preparing for We Work Together: Esperanza’s Annual Artists Show, Friday Dec. 2nd at Colibri Studio and Galley in Pilsen. While this event is a fundraiser, it’s also a celebration of the artists themselves. “Like all artists, they love seeing their work displayed in a gallery, says Joy Decker, executive director of Esperanza. “They feel such pride when others respond to their art. But ultimately, what people are responding to is the finished work. The pieces speak for themselves.” The name We Work Together was suggested by participant Anthony McClinton. “It’s because we work together,” says McClinton. “It’s how we do things at Esperanza.” This event is free, and is made possible in part by support from the Illinois Arts Council Agency. We Work Together: Esperanza’s Annual Artists Show is Friday, Dec. 2nd, 6-9 PM. Colibri Studio and Gallery is located at 2032 W. 18th Street in Pilsen. We Work Together will feature a variety of artwork in acrylic, ink and other media, as well as a new line of consumer products like tote bags and cell phone cases featuring the artists’ work. For information, please call 312.243.6097 x 131 or email jfenwick@EsperanzaCommunity.org, or visit EsperanzaCommunity.org.